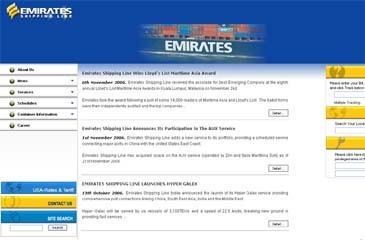 Emirates Shipping Line received the accolade for best Emerging Company at the eighth annual Lloyd's List Maritime Asia Awards in Kuala Lumpur, Malaysia on Nov. 2, 2006. Emirates took the award following a poll of some 14,000 readers of Maritime Asia and Lloyd's List. The ballot forms were then independently audited and the top companies in each category were then assessed by a panel of eight senior international shipping industry experts. "We are absolutely delighted to receive this award from the readers of Maritime Asia and Lloyd's List and we are honoured that such an eminent panel of judges selected Emirates Shipping Line to receive this award," said Vikas Khan, Chairman and CEO of Emirates Shipping Line. Emirates Shipping Line also has the honour of receiving the very first Emerging Company award introduced this year to recognise up-and-coming companies. This is the second award Emirates Shipping Line has collected in recent months, also receiving an Asia Logistics Award for best Emerging Company at a ceremony held in Singapore in October.